A friend sent me an interesting article. It points out much of the same causes for unhappiness that I see, so at first I accepted it without much question. Soon, however, it began to nag at me. Something didn’t exactly mesh; there was more too it. If you’re interested, this Why Generation Y Yuppies Are Unhappy, and see how it sits with you. It reminded me of the years when I was doing astrology and palmistry. I was always amazed at how often these moderately occult traditions seemed to hit the nail right on the head. The scientist in me wondered how the alignment of the stars could really have that much influence. I finally came to realize that the mind rather easily agrees with what corresponds to universal truths, even if we don’t see it as universal. Consequently, we easily conclude things like, “That’s true of the other guy, not me”, or visa verse. Astrology, for example, is simply a ‘catalog’ of common human attributes that all of us share to one extent or another. If we are in the mood to agree, we can; if we are in the mood to disagree, we can as well. Palmistry, being related to physiology, may hold a little more reality, but that base is soon left behind in favor of conjecture. As they say, there is a grain of truth in all myth. Expectations sow the seeds of all unhappiness, period. If you have a brain and think, you can’t help but harbor expectations. That is, if we picture the future, whether that is five minutes or five years from now. Therefore, this article clearly applies to all of us. 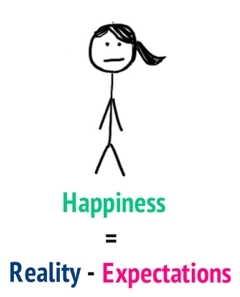 How unhappy our expectations make us depends on how seriously we take them… how real they feel. Or, to put this another way: The more that happiness is your goal, the more unhappy you’re bound to be.